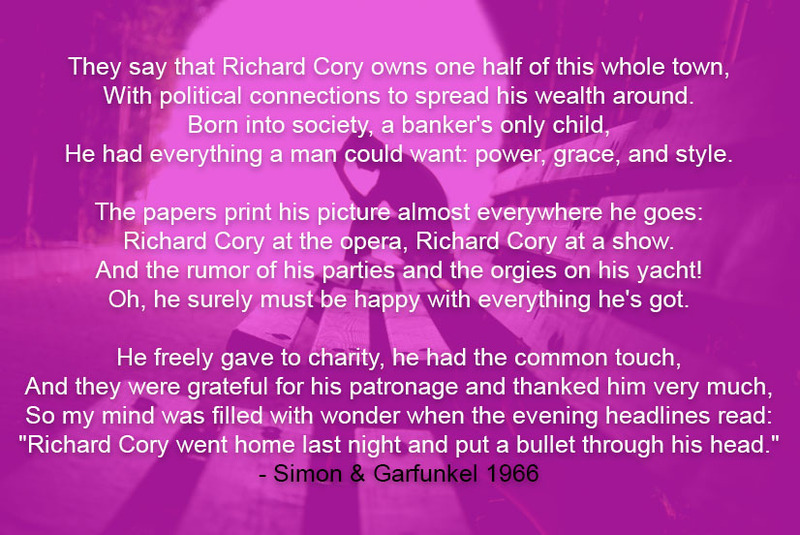 By Susan Tretakis – When Simon and Garfunkel released this song in 1966, I was enough of an English-major nerd to know it was based on a poem written by Edwin Arlington Robinson in 1897. It is a cautionary tale about admiring someone else and being misled by appearances. Today, the poem stays with me, shocking in its clarity about the dangers of depression. I have danced with depression my whole life. My father was diagnosed with depression as was his mother. I’m open about my journey with depression, a journey supplemented by my graduate and post graduate education, my own treatments with behavioral counseling, and yes, treatment with various psychotropic drugs. Depression is not an easy road to walk. But I will say that without a doubt, both Acupuncture and Traditional Chinese Medicine have helped me in ways that neither psychotropic drugs nor counseling managed to accomplish. As a mental health practitioner, I find this definition somewhat offensive. Does two weeks justify the use of psychotropic drugs that may force a rewiring of one’s brain? Add to this that antidepressants take time – usually 2 to 6 weeks – to work on an individual and may cause other physical concerns, such as disordered sleep, digestion, appetite and concentration – I have to step back – take a breath – and wonder. I am not dismissing anyone who is under a medical professionals’ care for depression; what I am suggesting – as someone who has personally been through years of “talk therapy” and a variety of prescribed medicines, that there is an alternative. It takes some independent research – some realistic thought as well as time to research alternative treatments for depression. Each of us needs to become our own advocate; for me, my depression has been greatly reduced – far more than when I was “blunted” from the realities of life by prescriptive drugs – by both acupuncture and Chinese herbs. Western medicine tends to treat the disease. Admittedly, our culture tends to demand “quick fixes”. We want the symptoms gone. Chinese medicine differs from Western medicine in that it treats the individual and not the disease. For me, the beauty of Chinese medicine is that acupuncture and herbs work together to create something larger than treatment with individual medications. In other words, there are a variety of drug-free ways to return to return to ourselves. While a “balanced energy” will not make the bills disappear, put money in your bank account, settle business conflicts, or deal with the ups and downs that are part of everyday living, but neither will psychotropic medications. By bringing one back to themselves, a balanced energy will result in what I refer to as “personal empowerment”. Acupuncture, combined with Chinese herbs, both calm and strengthen my spirit. To exist in today’s world, a person needs a strong and balanced spirit. I am concerned that psychotropic drugs do not recognize that depression is a layered and nuanced illness. There is “reactive depression” – sadness due to a loss of a friend or loved one, an unexpected financial issue or “chronic depression” – something that lingers and colors each and every day in varying shades of gray. There are so many types of depression that I now find it difficult to understand how one pill can fix everything. If Traditional Chinese Medicine has taught me anything, it is the belief that the body and mind cannot be separated. Finding the source – the root – of the depression is key to an individual’s success in overcoming depression. My acupuncturist diagnosed my liver qi stagnation in early 2017. Along with treatment and herbs, he explained that these negative emotions can also be affected by food. We systematically began eliminating and adding foods to strengthen my liver’s qi. Between acupuncture, herbal remedies and dietary changes, I was able to identify those times when I dipped my toe in the “depression pool”. I could tell when poor dietary choices and missed appointments raised my “liver heat” and how quickly I could cool my liver – and thus myself – down. I will admit that there are still days, to paraphrase “Richard Corey”, that I fight life’s daily disappointments and wish that I could be someone – or somewhere – else, but those days are shorter and far more less frequent then they were in 2016. Together, Acupuncture and Traditional Chinese Medicine have helped make my mind and body a “No Nesting” zone. If you are suffering with depression you owe it to yourself to explore the benefits of acupuncture and Traditional Chinese Medicine. Our holistic wellness center serves the communities of Coconut Creek, Coral Springs, Margate, Tamarac, Parkland, Deerfield Beach and West Boca. Schedule a free consultation with one of our experienced, skilled acupuncture physicians today!